In a culture that normalizes moderate alcohol consumption, it is important to ask whether there are any compelling benefits of daily alcohol consumption, even low to moderate consumption, that outweigh long-term costs. Alcohol use and abuse is widespread in this country. Its common and frequent consumption has been normalized and consequentially is considered an innocuous and routine part of life by many. Yet alcohol presents many problems for both individuals and society. "Of the 160 million Americans who are old enough to drink legally, 112 million do so. As many as 14 million Americans may have serious alcohol problems, and about half that number are considered to be alcoholic" (Julien, Advokat, & Comaty, 2008). Furthermore, based on data from 138,100 adults, statistical results from the 2009–2011 National Survey on Drug Use and Health showed that, "the prevalence of past-year drinking among adults was 70.5%, ... the prevalence of past-month excessive drinking was 29.3%, ... [and] the prevalence of past-month binge drinking was 27.4%" (Esser et al., 2014). Finally, according to "Helping Patients Who Drink Too Much: A Clinician's Guide," made available by the National Institute on Alcohol Abuse and Alcoholism, "Drinking at lower levels may be problematic depending on many factors, such as age, coexisting conditions, and use of medication" (2005). There are no black-and-white benchmarks as to when the physical, psychological, and psychosocial risks of drinking outweigh the benefits. Certainly, cases in which there is a past history or pattern of violence under the influence of alcohol and/or drunk driving are cause for concern about whether drinking should continue at the same frequency and volume. However, the legal or personal consequences from having, for example, one to three drinks at home, three to five times per week, are often neither immediate nor obvious. But the aforementioned evidence supports the argument that for most people, the frequent consumption of even moderate amounts of alcohol can incur costs that ultimately outweigh the benefits. Social workers—with their experience and expertise in conducting assessments, identifying appropriate resources, and implementing solution-focused approaches—are well equipped to assess clients for harmful drinking patterns and provide healthier options for them. Angelica and Raymond are both professionals and have two children together, ages 4 and 6. They typically do not get home from work until about 6:30 PM. Almost every weeknight, Angelica and Raymond have family dinners; Angelica usually begins by drinking a large glass of wine while preparing dinner. Sometimes she has an additional, smaller glass of wine before bedtime. Raymond usually has one to two beers with dinner and sometimes one glass of wine or a shot of whiskey later in the evening. Angelica notices that most weeknights, she is usually too tired to play games with the children and is irritable and impatient with Raymond. In terms of criminal history, Angelica has never had a driving under the influence (DUI) charge and has never been physically violent toward others. Raymond had one DUI in his 20s when he was binge drinking but has had no further legal issues related to alcohol. However, three times in the marriage he became physically aggressive with Angelica after drinking four to five beers. On one occasion he roughly grabbed her cell phone from her; on another he grabbed her arms and shook her; and in the third incident he verbally abused her and shoved her so hard she fell over backwards. Raymond, when sober, has no such instances of psychological or physical abusiveness. Why Are Raymond and Angelica Drinking? Raymond and Angelica probably drink alcoholic beverages for many personal and social reasons. They may enjoy the taste and craftsmanship of the beers and wines they purchase. They may drink because they identify it as a way to bond with one another. After all, it is one of the few activities that both of them truly enjoy doing together in the evenings. Angelica thinks that her second glass of wine helps her to sleep better. Alcohol in low doses also acts as an anxiolytic (or antianxiety drug), and this can help to relieve stress at the end of a long workday. Unfortunately, those benefits do not come for free. For example, alcohol actually can disrupt sleep and lead to lower quality sleep (Ebrahim, Fenwick, Williams, & Shapiro, 2015). Neither Raymond nor Angelica would say they have problematic drinking. Raymond would say that he has only been "rough" a few times in their six-year marriage, and there have been no legal or obvious medical consequences from their drinking during the marriage. Many couples with whom they associate drink at the same rate and volume and have had similar alcohol-related incidences, so in this social context their drinking has not raised any red flags. What Are the Physiological Consequences of Their Drinking? Firstly, alcohol obviously could negatively affect Raymond and Angelica's long-term physical health. A multitude of studies indicate there could actually be a protective effect of light to moderate drinking of alcohol on coronary disease, leading some to suggest that abstinence may not be the best route for many people. Gabrielle Glaser, author of Her Best-Kept Secret: Why Women Drink — And How They Can Regain Control, wrote an article for The Atlantic in which she states, "The prospect of never taking another sip is daunting, to say the least. It comes with social costs and may even be worse for one's health than moderate drinking: research has found that having a drink or two a day could reduce the risk of heart disease, dementia, and diabetes" (2015). Unfortunately, it is not clear that moderate drinking provides overall health benefits. In fact, recent large-scale studies challenge such conclusions. In their study of 261,991 individuals of European descent, Holmes et al., (2014) wrote, "[F]indings suggest that reductions of alcohol consumption, even for light to moderate drinkers, may be beneficial for cardiovascular health. Our results therefore challenge the concept of a cardioprotective effect associated with light to moderate alcohol consumption reported in observational studies and suggest that this effect may have been due to residual confounding or selection bias." In a 2014 health blog, Tony Blakely, MBChB, MPH, PhD, FAFPHM, and Nick Wilson, MBChB, DIH, MPH, (2014) summarize the J-shaped associations found in the EPIC study between alcohol and death rates by various conditions including coronary artery disease, alcohol-related cancers, respiratory disease, and injury. They highlight that the study indicates a J-shaped association not only between alcohol dosage and coronary artery disease but also between alcohol dosage and injury as well as respiratory illness, conditions that are "not plausibly biologically associated with alcohol." These J-shaped associations indicate what on first-glance look like protective effects from a moderate range of alcohol consumption but could actually be due to "unresolvable bias." Blakely and Wilson wrote, "For example, people drinking alcohol in moderation do lots of other things in moderation, and may be generally healthier; we (as researchers) are unable to fully adjust for this in our observational studies—no matter how hard we try to analyze the available data" (2014). Bergmann et al. (2013) highlight that the relationship between light to moderate alcohol consumption and good physical and mental health is likely correlational, not causal. In other words, we only see these associations in the data, but we do not know the multiple factors that give rise to health status and changes in health status. They go on to say that "Previous studies leading to the causal understanding may be also biased by self-selection of healthy survivors. This speculation is supported by the findings in our study that former moderate users still had a higher risk of dying than 'current' moderate users." Even if there are cardioprotective effects of light to moderate drinking, there are alternative behaviors that carry fewer risks. To quote the Harvard School of Public Health website (2015), "If you don't drink, there's no need to start. You can get similar benefits with exercise (beginning to exercise if you don't already or boosting the intensity and duration of your activity) or healthier eating." Angelica and Raymond also are at increased risk for certain kinds of cancer due to their drinking. "For the cancers that have been identified as being causally linked with alcohol, we are absolutely certain that alcohol causes these cancers. … There is no risk-free level of alcohol consumption. There is always some risk, and the risk increases in accordance with the level of consumption," according to Jurgen Rehm, PhD, contributor to the 2014 World Cancer Report (Stokowski, 2014). There is not a consensus regarding which components of cognitive functioning are affected by alcohol. However, there are multiple studies that indicate alcohol, even in moderate doses, has negative effects on attention (Abroms, Gottlob, & Fillmore, 2006; Dougherty, Marsh, Moeller, Chokshi, & Rosen, 2000) and working memory (Saults et al., 2007). It is reasonable to deduce that if attention and/or working memory are negatively impacted, then the ability to be present and mindful during discussions and activities and to recall important details may be limited, thus harming intimate relationship skills. Although few and far between, Raymond's outbursts of violence under the influence of alcohol have caused long-term harm to Angelica's feelings of trust, safety, and eroticism. Why would Raymond, who has never been violent under the influence of three drinks but is sometimes violent under the influence of four, not be vigilant about ensuring he never exceeds three drinks? Like many people, Raymond and Angelica are more mindful about measuring their self-administered dose of ibuprofen and even their vitamins compared with alcohol. Because of the normalization of the frequent consumption of alcohol and the societal minimization of its effects, however, Angelica and Raymond may not really stop and consider how the impatience and fatigue due to alcohol consumption is affecting their ability to parent and nurture themselves and one another. For them and most families, the time in the evenings is most of the time they have together as a family during the week, and nightly drinking means that most of this time with family will be spent under the influence of alcohol. Social workers, with their training in assessment and providing psychoeducation and referrals, are an important societal resource for helping individuals as well as impacting a change at the community level of what is considered a normal amount of alcohol consumption. What is considered "high-risk drinking" is no longer clearly defined. Although many may assume that most excessive drinkers are also alcohol dependent, Esser et al. found that "most excessive drinkers (90%) did not meet the criteria for alcohol dependence" (2014). They point out that a comprehensive and systemwide approach to reduce excessive drinking—such as individual screening and brief counseling, as well as policy strategies such as raising alcohol taxes—would seem to be more effective than simply focusing most resources into alcohol treatment centers. 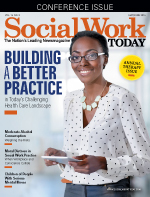 Social workers certainly have the skills to implement these counseling and policy strategies. Helping Patients Who Drink Too Much: A Clinician's Guide is available for free online and has clear steps on how to efficiently assess and assist those with high-risk drinking. In addition, health care providers and social workers can screen for and encourage high-risk drinkers to consult their doctors and therapists for a thorough medical evaluation to identify effective ways to address underlying issues (e.g., stress, anxiety, or sleep disorder) that may be leading to self-medicating with alcohol. Cognitive behavioral therapy and mindfulness practices have empirical research supporting their effectiveness in treating depression and anxiety. Transcranial magnetic stimulation of the brain has also shown promising results in treating depression and PTSD. Additionally, advances in sleep-medicine research have led to the development of technology that can help improve quality and quantity of sleep. People also have more options now for treating drinking patterns that are causing problems. The Affordable Care Act of 2010 allows for more people to receive mental health and substance abuse treatment in cases of an emergency and also as a part of chronic care and with follow-up services. Social workers, in their positions at hospitals and rehabilitation centers, will be key players in delivering these services. Naltrexone, as well as several other opioid antagonists, has been shown to be effective in allowing heavy drinkers to transition to more moderate levels of drinking. One study indicated that naltrexone and medical advice alone were as effective as naltrexone in combination therapy with psychosocial interventions such as group or cognitive-behavioral therapy (Latt, Jurd, Houseman, & Wutzke, 2002). Although this is very promising, it is important to take into account that many people have goals in addition to maintaining abstinence from alcohol. Other goals they may have include decreasing anxiety and depressive symptoms, increasing empathy for self and others, and rebuilding trust that has been damaged with family members. Individual and group psychotherapy as well as public support groups, frequently facilitated by social workers, teach coping strategies as well as relational skills. It would be wonderful if alcohol does have cardioprotective and other health benefits when consumed in moderate amounts. For social and professional reasons alone, it is difficult for many to remain abstinent from alcohol. However, it is important for the consumer to have all of the data regarding alcohol and its effects on health. To that end, the above tools and resources provide social workers with options to implement with those who may benefit from altering their drinking behaviors. Social workers can be key players in helping individuals with harmful drinking patterns and challenging the social norm that moderate drinking is innocuous. Many adults can go for decades functioning adequately while drinking moderately. However, as illustrated in the story of Angelica and Raymond, there is likely the inability to live to one's full potential. The effects of consistently dulling one's ability to be mindful, combined with the exacerbation of relationship-degrading traits—such as fatigue, impatience, or disengagement—may not be setting off any imminent warning signs, yet may be causing short-term issues that accumulate into long-term harm. There do not appear to be compelling benefits of daily alcohol consumption, even low-to-moderate consumption, that outweigh long-term costs. If we want to continue to normalize moderate drinking, it is also important we are doing this with the knowledge that it is a luxury that carries risks as well. — Beth Christopherson, LCSW, is a private practitioner in Houston, Texas. Abroms, B. D., Gottlob, L. R., & Fillmore, M. T. (2006). Alcohol effects on inhibitory control of attention: Distinguishing between intentional and automatic mechanisms. Psychopharmacology, 188(3), 324-334. Bergmann, M. M., Rehm, J., Klipstein-Grobusch, K., Boeing, H., Schutze, M., Drogan, D., et al. (2013). The association of pattern of lifetime alcohol use and cause of death in the European prospective investigation into cancer and nutrition (EPIC) study. International Journal of Epidemiology, 42(6), 1772-1790. Blakely, T., & Wilson, N. (2014). Glass half full: Alcohol's health benefits for cardiovascular disease still controversial, and likely vary by context. Retrieved from blogs.otago.ac.nz/pubhealthexpert/2014/01/21/glass-half-full-alcohols-health-benefits-for-cardiovascular-disease-still-controversial-and-likely-vary-by-context/. Dougherty, D. M., Marsh, D. M., Moeller, F. G., Chokshi, R. V., & Rosen, V. C. (2000). Effects of moderate and high doses of alcohol on attention, impulsivity, discriminability, and response bias in immediate and delayed memory task performance. Alcoholism: Clinical and Experimental Research, 24(11), 1702-1711. Ebrahim, I., Fenwick, P. B., Williams, A. J., & Shapiro, C. (2015). Alcohol and sleep review: Sound statistics and valid conclusions. Alcoholism: Clinical and Experimental Research, 39(5), 944-946. Esser, M. B., Hedden, S. L., Kanny, D., Brewer, R. D., Gfroerer, J. C., & Naimi T. S. (2014). Prevalence of alcohol dependence among US adult drinkers, 2009–2011. Preventing Chronic Disease, 11, e206. Glaser, G. (2015, April). The irrationality of Alcoholics Anonymous. The Atlantic. Retrieved from http://www.theatlantic.com/features/archive/2015/03/the-irrationality-of-alcoholics-anonymous/386255/. Harvard T. H. Chan School of Public Health: The Nutrition Source. (2015). Alcohol: Balancing risks and benefits. Retrieved from http://www.hsph.harvard.edu/nutritionsource/alcohol-full-story/#what_is_moderate. Holmes, M. V., Dale, C. E., Zuccolo, L., Silverwood, R. J., Guo, Y., Ye, Z., et al. (2014). Association between alcohol and cardiovascular disease: Mendelian randomisation analysis based on individual participant data. BMJ, 349, g4164. Julien, R. M., Advokat, C. D., & Comaty, J. E. (2008). A primer of drug action: A comprehensive guide to the actions, uses, and side effects of psychoactive drugs. 11th Ed. New York, NY: Worth Publishers. Latt, N. C., Jurd, S., Houseman, J., & Wutzke, S. E. (2002). Naltrexone in alcohol dependence: A randomized controlled trial of effectiveness in a standard clinical setting. Medical Journal of Australia, 176(11), 530-534. National Institute on Alcohol Abuse and Alcoholism. (2007). Helping patients who drink too much: A clinician's guide. Retrieved from http://pubs.niaaa.nih.gov/publications/Practitioner/CliniciansGuide2005/clinicians_guide.htm. Saults, J. S., Cowan, N., Sher, K. J. & Moreno, M. V. (2007). Differential effects of alcohol on working memory: Distinguishing multiple processes. Experimental and Clinical Psychopharmacology, 15(6), 576-587. Stokowski, L. A. (2014, April 30). No amount of alcohol is safe. Retrieved from http://www.medscape.com/viewarticle/824237.